EPBOT: This Is A Triumph? 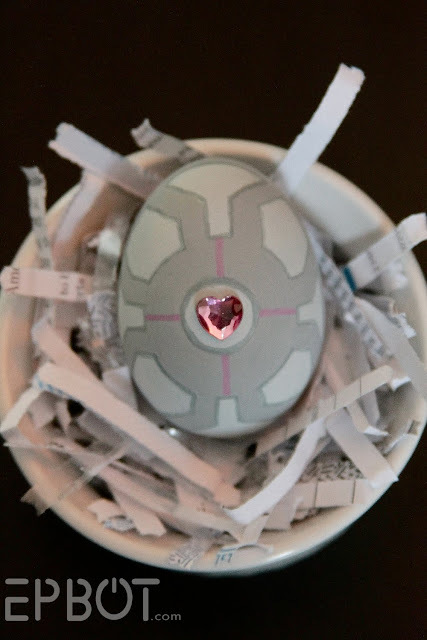 I searched everywhere for a companion cube Easter egg online, but all I could find was a cube drawn on the egg. Since I wanted mine to look like the egg *was* the cube, I spent some time sketching to get the design right. Each companion egg is double sided, and I used rhinestone hearts in the centers for a little sparkle. The eggs are foam with a hard coating, which allowed me to put small screws in the bottoms so I could hang on to them while painting, and then hang them to dry after painting. Very handy. I have several more Portal Eggs in the works, but I wanted to at least show you guys these in case the rest aren't done by Sunday. Stay tuned! This IS a triumph! It's hard to overstate my satisfaction. ^-^ So adorable! Turning a cube into an oblong shape looks difficult, but it worked beautifully. SUPER CUTE Jen! you are SO talented! Can't wait to see the rest of them! I really like the touch the rhinestone hearts add to the eggs. Much better than just painting them on. These are very cute. Are you making a potato GLaDOS? If not, you definitely should. OMIGOSH, the lemon grenade!! I'm making a note here: HUGE SUCCESS. I also love love love the sparkly hearts. So cute! The turret stand on the egg in the other pic has something over the legs to make them thicker, like a plastic sleeve or coating off of a wire. That's what my non-crafty eyes noticed anyway. Have a great vacay and safe drive home! Alex, I found the eggs at Micheals. They come with a speckled finish on them in a little baggy. The Companion Egg is perfect. 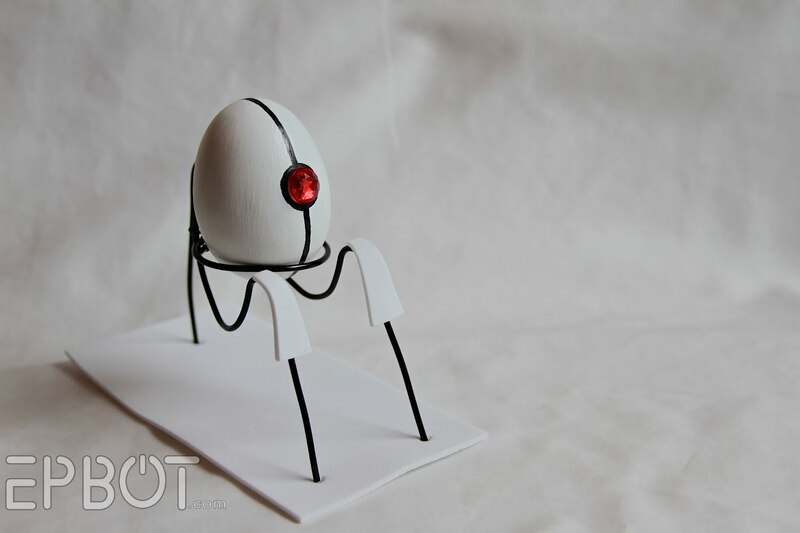 If Aperture Science themselves had made them (imagine having an egg instead of a cube for all those puzzles!) it wouldn't have looked any better. These are so cool! 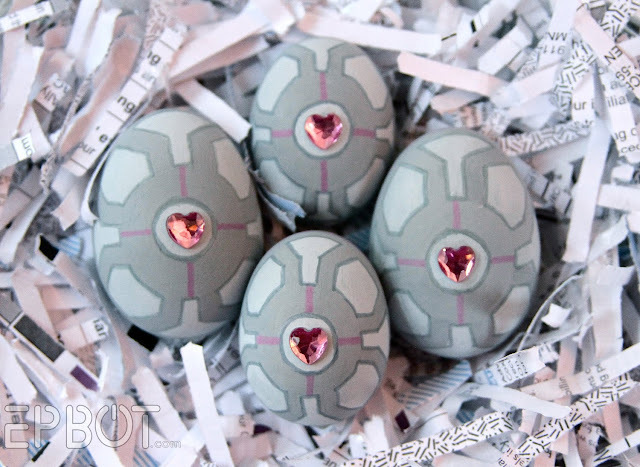 I really like the companion eggs. They all look fantastic! I used to live in Williamsburg and I super get a kick out of thinking of my favourite blogger and hubby running out to the same craft store I did. You rocked the Portal eggs! I love the cubes - the rhinestone hearts really are the perfect touch of sparkly. Happy Easter! Love love love these. They are awesome. Man now I want to do some mabe for next year tho'. Don't play portal so I am not as up to date on all the characters/parts. So that may explain why i thought, when looking at your Lemon Grenade,"Oh, Dr. McKay will NOT like that!" Okay so I don't play/watch portal, so I went A HAL EASTER EGG!! 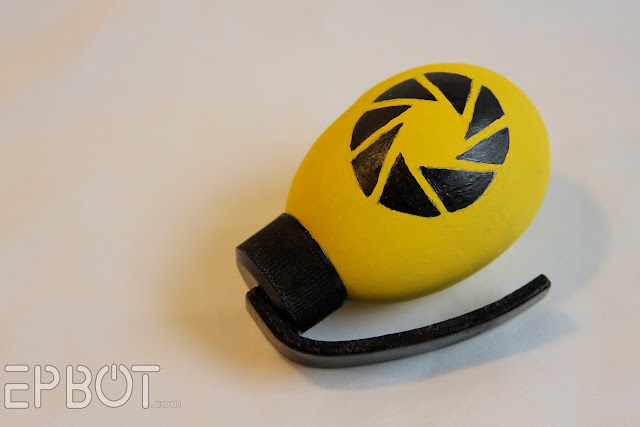 I love the turret egg. So perfect. Although I can't picture anybody giving Cave Johnson a basket of Easter eggs. Maybe if they were radioactive moon rock Easter eggs. You did a wonderful job, and not to sound criticle or anything, but no Wheatley, or pesonality core eggs? I think you just made my weekend, thank you. These are amazing! You are so talented!! Wow! Those are amazing. I follow your Cake Wrecks blog and just stumbled on this one following another of your posts, and I'm so glad I did. 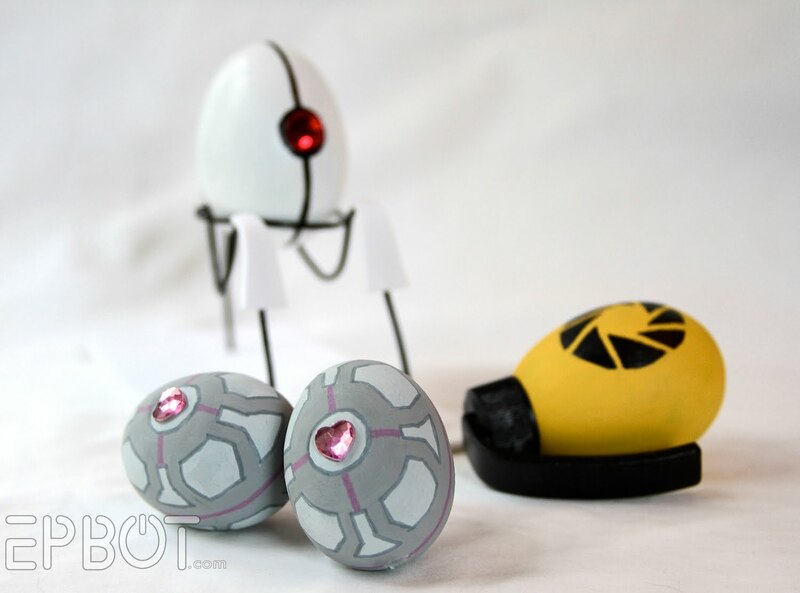 I love Portal, and those eggs are so creative and adorable. You have true talent. Thanks for sharing. Awesome eggs, Jen! I definitely need to show them to my daughter, who has played Portal 2 (I watched my husband play Portal, so I get some of the jokes). No steampunk egg? *laughs* Maybe that's next on the list! So how did you make the foam eggs hard so you could paint on them? I really want to make these for Easter! You did such a great job!